What secrets await inside the Vault of Spirits? 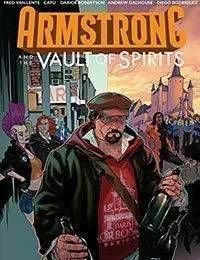 Deep beneath New York City's seediest dive bar, Armstrong – the hard-hitting, harder-partying immortal veteran of history's greatest escapades – is hosting an invitation-only affair for his most beloved friends and allies! Archer… Ivar, Timewalker… Faith… Quantum and Woody… And special guests from across the Valiant Universe… All have been offered a seat at the table for a personally guided tour of Armstrong's most valuable and tightly guarded treasure… From the Great Flood to ancient Greece to the height of the Crusades, raise a glass as Armstrong recounts the true stories of his wine-soaked path down through the ages and the artifacts that reside within his own secret archive! ARCHER &amp; ARMSTRONG maestro Fred Van Lente returns with rising star CAFU (RAPTURE) to chronicle the first landmark solo adventure in the very (very, very) long life and times of Valiant's very own disorderly immortal!